Sharing is at the core of everything we do here, which is why we are so pleased to have improved the sharing project work flow with our latest update. Often users have multiple email addresses, or even multiple email addresses which point to the same email, such as bob.smith@gmail.com vs bobsmith@gmail.com. If you wanted to share a project with a user, you needed to know which address they used on ShareLaTeX. Last week we released a great improvement to the entire sharing process to fix these issues. 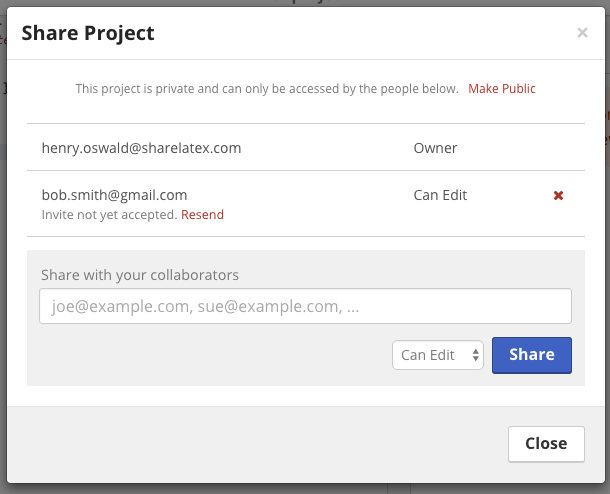 When sharing a project an, invite will be sent the to email address you shared it with. If there is an account registered on ShareLaTeX with that email address it will also show an invite at the top of their project list page. This means that you can accept an invite with whatever account/e-mail you're currently using in ShareLaTeX - even if a project was shared with your gmail address, you can accept the invite with your university email address account. The improved share box now also shows if your collaborator has accepted the invite, and if not you have the option of sending another invite to them. We hope you like these improvements as much as we do. They should result it a frictionless process for sharing projects.